If you remember the 1985 sci-fi flick”Back to the Future,” (BTW: if you saw it when it first came out, you’re about as old as I am, in which case, you will relate to this article) you will remember good old Marty McFly (Michael J. Fox) hopping into Dr. Emmett (Doc) Brown “s (Christopher Lloyd) time-traveling DeLorean into the past at Mach 5 speed. In what seems like no time at all, the two manage to go back thirty years. If only we all could be so lucky. 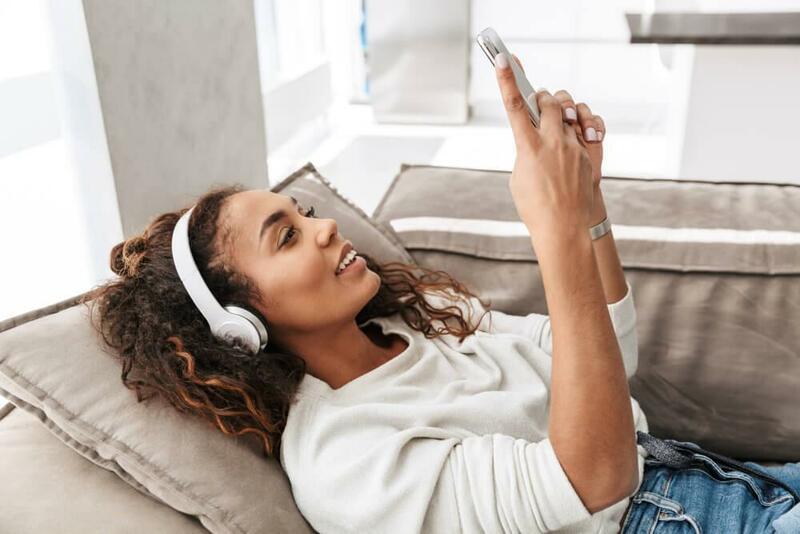 When the skin begins to show signs of aging, it may seem like it happens overnight, but in reality, it’s a process that took place over many years, and, aside from plastic surgery, it likewise takes a while to reverse. 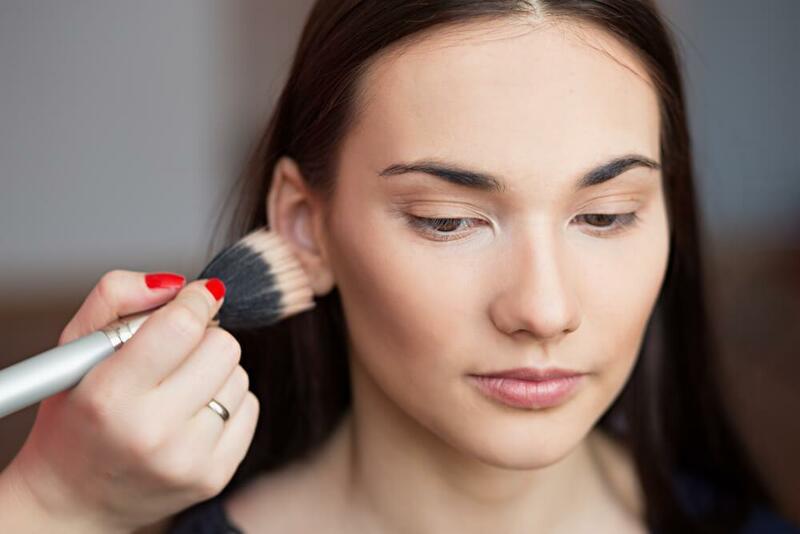 Usually, even the most powerful lotions and creams take at least two weeks to make any improvement, others you can wait a lifetime and still see no results. I’d been there, done that, and mostly grew to accept my plight, until I found the Orogold Exclusive 24K 60-Second Eye Solution. I’d like to say that the product just came to me, like my own souped-up DeLorean blazing out of the sky to take me to the land of eternal youth, but alas, I can’t. 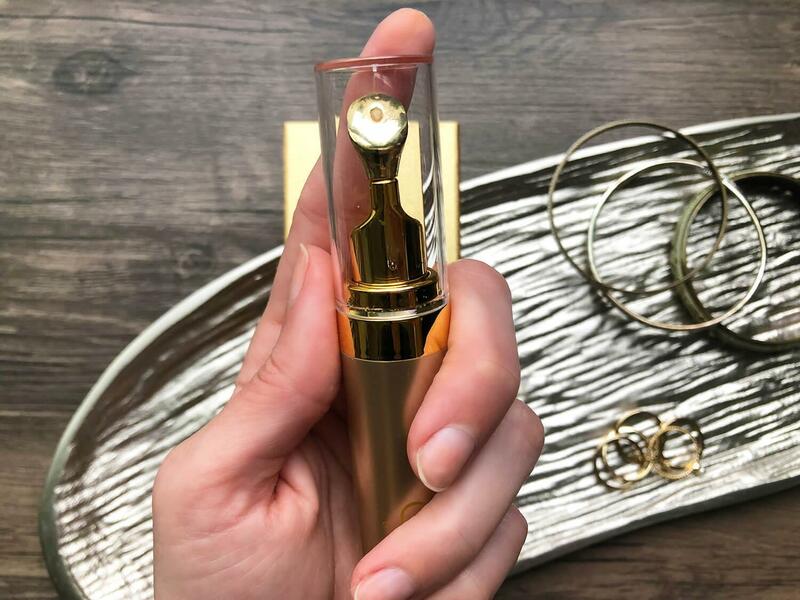 Although the eye serum may be equivalent to a DeLorean in terms of luxury, it took me a great bit of searching to find the Orogold. Luckily, it worked so quickly, it made up for lost time and then some. Here is the story of my own miraculous journey which led me to the Fountain of Orogold. Here I am, a few years after “Back to the Future” had come out in sunny Los Angeles, California. The future is so bright I have to wear shades. (again I am dating myself, but I digress). The sun is out all the time and I’m soaking it up, literally. That means my face, my neck, and my chest are all soaking in those damaging ultraviolet rays that everyone warns you about these days. At the time, however, to me, those rays meant a golden tan. I am naturally blond (ish), and my skin is on the fair side, so typically when I go to the beach for the first time each year, I get a slight burn. However, gradually my skin starts to grow a (what I like to call) “tolerance“ to the sun. Either way, by the middle of the season, I would be glowing. Add to that a few sun enhanced streaks in my crowning glory and a white bikini, and I was what you might call the definition of a “California Girl.” As a consequence, I grew into what I would call the “California Woman.” The Beach Boys don’t mention her in their pop ditties. By the time I was in my late twenties, I noticed lines forming around my eyes. I was reluctant to call them crow’s feet, but, to be fair, there was no other word for them: fine lines fanning out at the outer the corners of my eyes. At first, they only showed when I smiled, and I thought they even added a little character, but as I got older, they stopped going away when my mouth relaxed, and the cute factor “got old” pretty quickly. There was no denying it; I had a full-on problem with aging skin, and I needed to make some serious reparations. It didn’t take an expert to tell me my eye area was especially prone to wrinkles, but I did get information from some reliable sources explaining the cause. The tissue around the eyes is the thinnest on the body and it lacks protective lipids. Those lipid lackers not only cause the slackness around the eyes, but they also make the area difficult to treat. Highly active formulas can irritate the delicate skin around the eyes, causing an inflammatory response that can further damage tissue. I would have to do some thorough vetting before I chose the product that would give my eyes the “royal treatment ” they deserved. Would it be too corny to say that when I first spotted the Orogold Store it was a sight for sore eyes? There it was, like a pot of gold at the end of the mall escalator. A store filled with women like me, only happier and slightly younger-looking receiving expert pampering at the hands of the knowledgable staff. I knew I had found my calling. 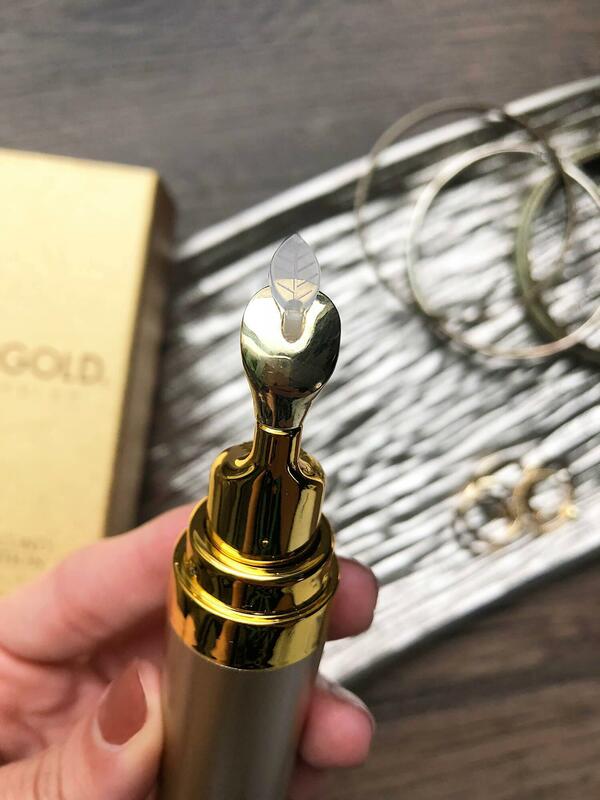 For those not in the know, as I was not when I first walked in, Orogold is a company known for its upscale products with the latest “buzzword” ingredients, 24K gold among them. 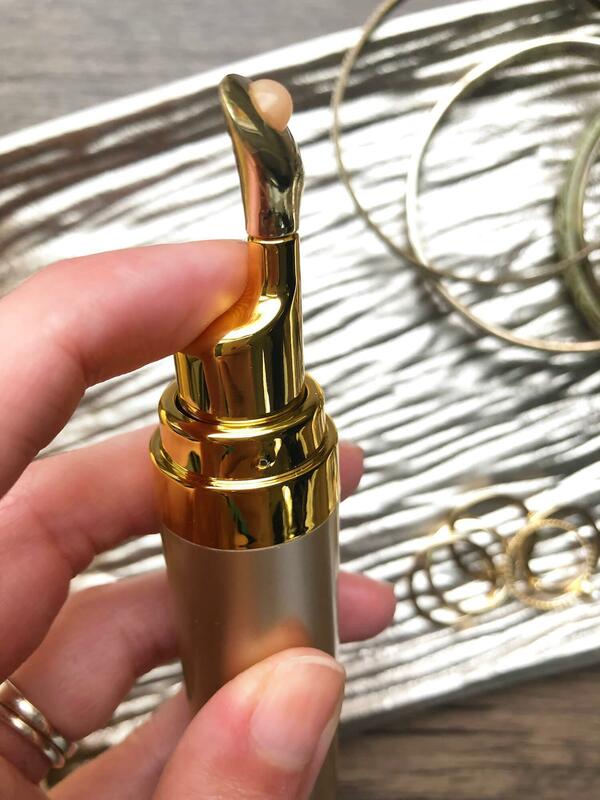 Most of the products in the store contain real gold that you can actually see on your skin when you apply them. Who wouldn’t look better with a little added bling on their skin? No wonder the shoppers looked so happy, they had found gold! I was eager to join the prospectors. Luckily, there was plenty of wealth to be shared. Every Orogold store is staffed with beauty consultants handing out freebies as well as advice. Yes, please, I’ll take a bit of both. I approached a random staffer and told her my story. She was no stranger to my situation. She didn’t even flinch when I showed her the damaged area. She calmly went to the back of the store and came out with what I now know as my skin savior: The 24K 60-Second Eye Solution. I liked the 60-second thing immediately. Not only did it mean I had a product that would work quickly, but it also meant I would know whether the product worked before I left the store. The way I looked at it, it was like getting a free meal ticket for my face. But, I have to admit, I was skeptical. Sixty seconds – that wasn’t even enough time to heat up my coffee in the microwave. Could this product possibly work faster than that? Let me start by saying I’m sort of a skeptic. I don’t believe in UFOs or aliens; I don’t believe in ghosts. 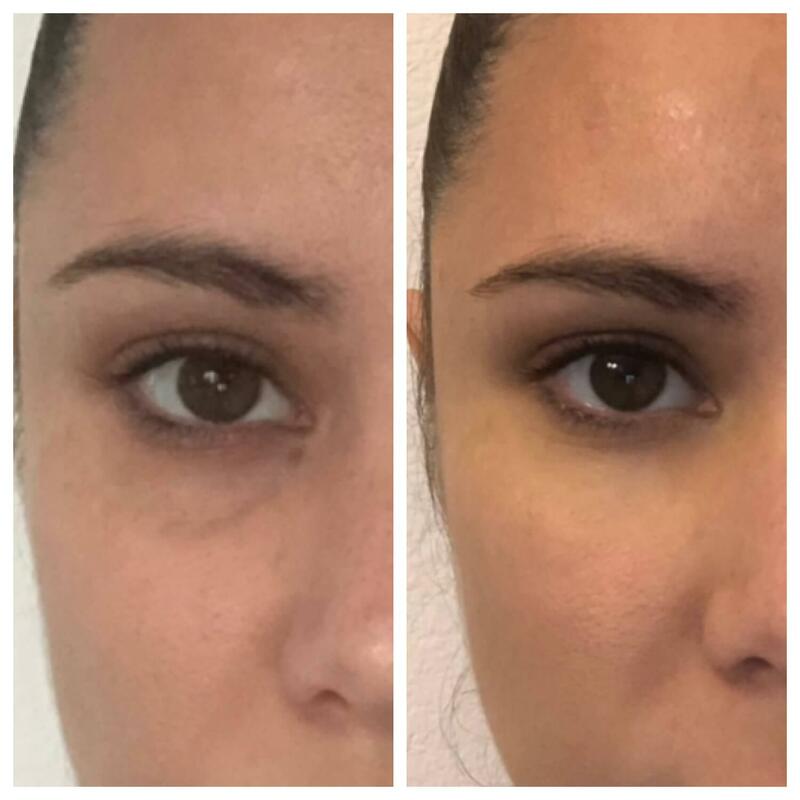 I even have a hard time accepting that before and after pictures aren’t seriously photoshopped, but if there is one thing I believe in, its the 24K 60-Second Orogold Eye Solution. Why? Because seeing is believing and what I saw that day ( and have continued to see thereafter) made a believer out of me. I applied the solution, and I don’t even think it took sixty seconds to work. I felt the skin around my eyes getting immediately tighter. Seriously, it was an instant eye lift- it was almost scary. And when I looked in the mirror – OMG! Not only were the lines around my eyes noticeably less noticeable, but there was also no puffiness, no dark circles, and no undereye sagging. None! Zilch! Zero! Hasta luego patas de gallo (crow’s feet in Spanish) it was all about la Vida loca from now on. And while we’re talking in Spanish, let’s talk about the Oro. Remember how I said that when you applied the Orogold products, you could see the gold on your skin? Reader, the skin around my eyes lit up like the staircase Frank Sinatra walked up when he performed “My Way.” I looked like an A-List celebrity, at least the area surrounding my eyes did. It was taught and shiny and flawless. I would take a life long subscription. I was sold on this product. 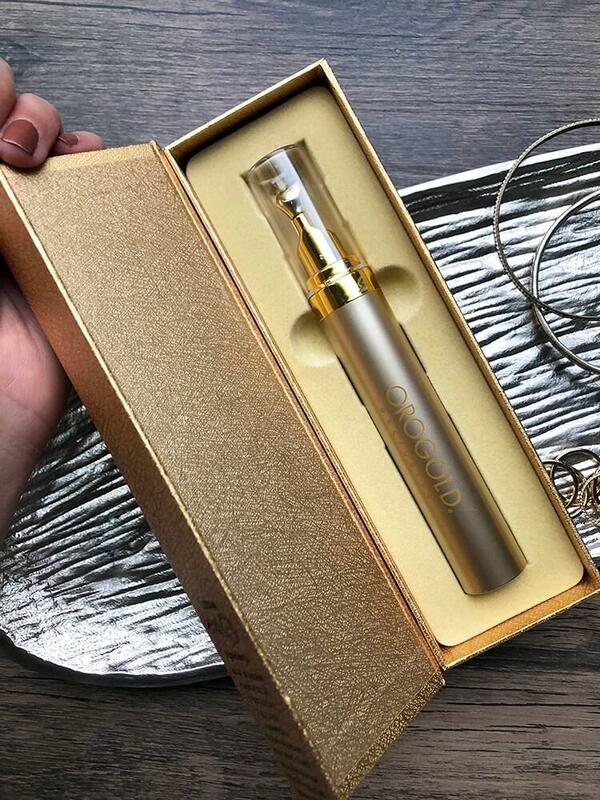 If only my man was as thoughtful about packaging as Orogold is. The box is gorg-wah! (Gorg – eois?) Whenever I get an Orogold product, I find myself trying to find ways to incorporate the box (old gold, slightly metallic) into my home décor. Where is Martha Stewart when you need her? But what gave me the biggest kick was the Authentication Certificate. As soon as I opened the box, a gold embossed card fell out informing me that my product contained real gold from Italy! Che Bella! I felt the amore immediately. And the bottle? Warhol would approve. If he had signed his name to it, it would have fetched a fortune. 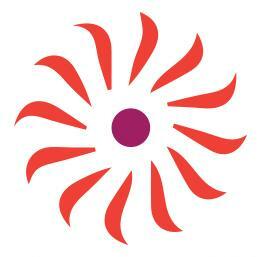 Think dental tool meets beauty tool to get a basic idea. Functional and fabulous! When I first squeezed the Orogold into my hand, I was surprised. I was expecting something white and serum like, but this is transluscent and its consistency is more liquidy than any cream or serum I had tried before. I am happy to report it disappeared into my skin leaving only a sparkle and an intoxicating smell behind. It’s a fact, waking up is hard to do, and if you’ve ever woken up with your eyes puffy and half closed you know it can be close to traumatic. I can’t count the days when I had to put frozen peas on my face waiting for my eyes to emerge from my face to the point where my eyeliner stick didn’t seem like a dangerous weapon. 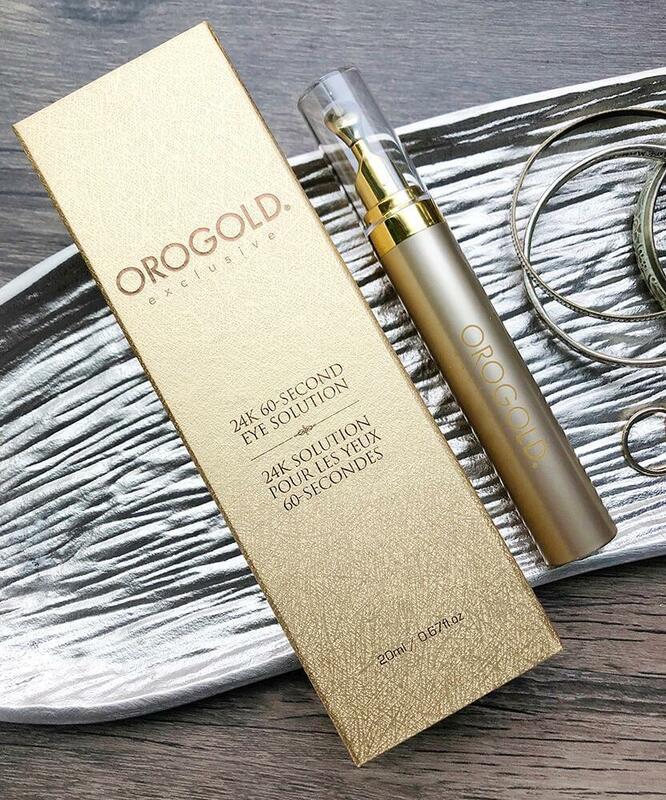 But with the Orogold 24K 60-Second Eye Solution, the name says it all. In sixty seconds, I become the incredible shrinking woman from my neck up. 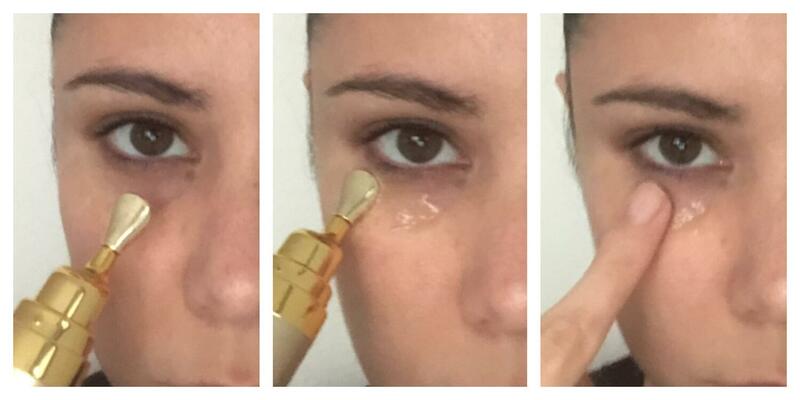 I just apply the smallest dab to my eye area and my skin tightens immediately. Plus, I can’t believe how amazing the gold makes my skin look. I look chiseled! Who would have thought I would ever look chiseled? So, I knew that the Orogold worked in 60 seconds, but the real test was whether or not it would continue to work a few weeks on. Was it just a bandaid on the wound, or would it actually help to reverse some of the lasting damage? I’ll start by saying that, If the Orogold was said bandaid on the wound, I would wear it like a badge of honor. After a few weeks, I couldn’t imagine my life without it. I felt like a new woman. My tighter eyes didn’t only look better (like Hello, Gorgeous better) they actually kept me more awake during the day. Mid-day slump? No problem. I’d just dab some of that Orogold on my eyes and I had my afternoon fuel and then some. I was also surprised by how much the way my eyes felt influenced my performance at work. I became a work producing machine. I even got promoted! Orogold was not only healing my skin, but it was also healing my life! As for a long-term remedy, the Orogold did make noticeable lasting improvement. I began waking up looking a bit more deflated. My eyes weren’t as puffy and the lines under them weren’t as pronounced. I still applied the Orogold though. I had become seriously addicted to the smell, plus I’d like to think the gold sparkle had become my signature. I felt naked without it. As I look back on my Orogold journey, I feel I have come full circle. I started out as a naïve sun worshipping California girl with skin aglow, and I ended up a successful California woman with skin still aglow. Of course, no one knows it didn’t happen seamlessly. (except, of course, everyone who reads this article). 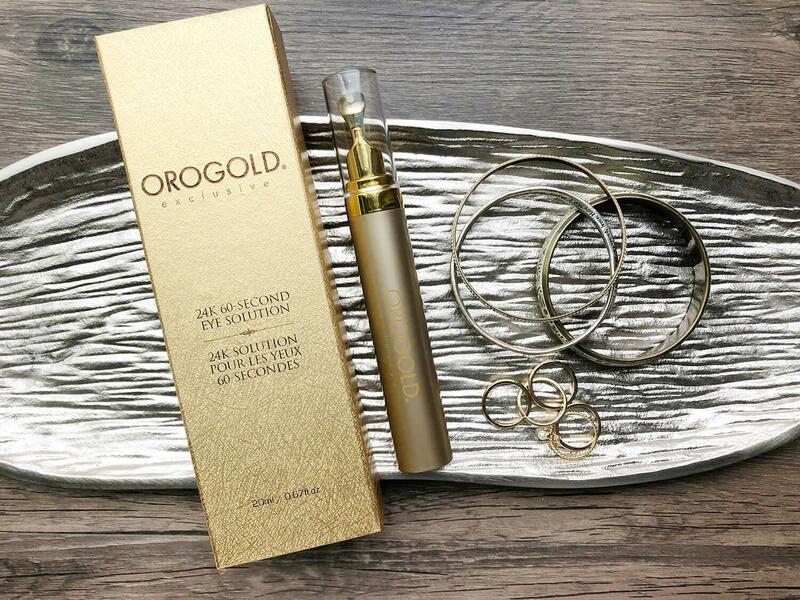 Orogold not only recovered my youth, but it also made me a more confident adult, and that’s priceless. 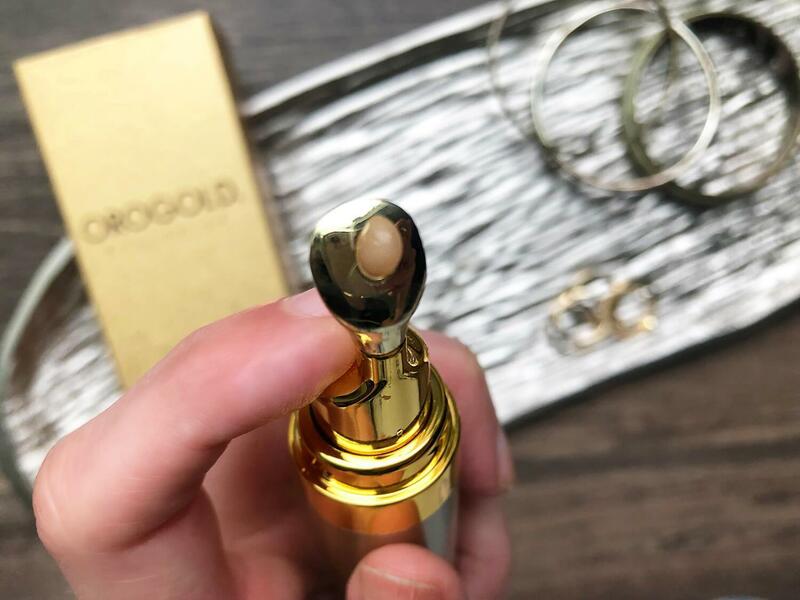 If you’re feeling your sparkle fading, go to Orogold and get the 24K 60-Second Eye Solution and may your future will read like my past. Write in so we can compare notes!